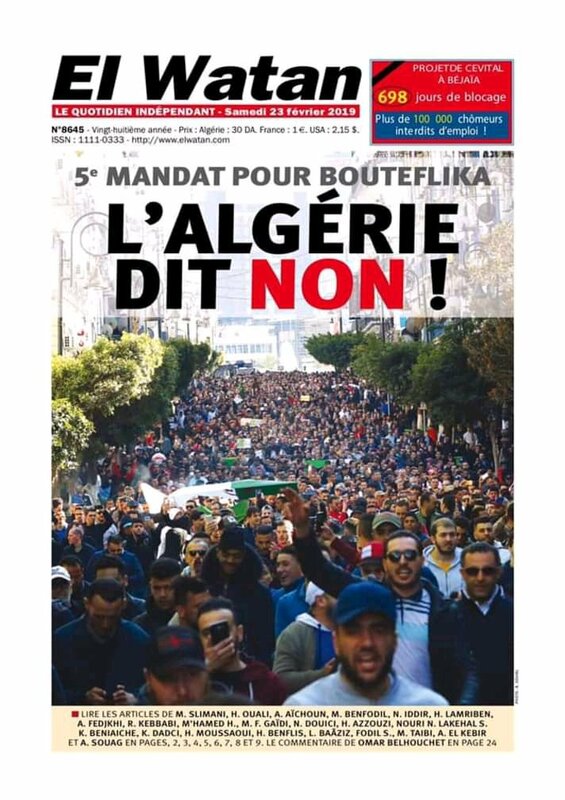 In a big surprise to the world, Algerians organized huge protests across the country since early Friday against the candidacy of President Abdel Aziz Bouteflika for the presidency for the fifth time. Since early hours of Friday morning even before the prayers, reports came through the social media in Algeria that people began to mobilize in protests against their old president who officially declared their presidency candidacy from a couple of weeks ago. Bouteflika is already in Switzerland undergoing some medical exams. The 81-years-old president had already suffered from a stroke in 2013 that affected his mobility as well as the ability to talk. According to Algeria’s official news agency, the following states witnessed protests : Algiers “The Capital” , Annaba, Constantine, Bejaia , Batna, Skikda and Oum El Bouaghi in the East; Tizi Ouzou ,Bouria, Boumerdès , Tipaza in Mid Algeria ; Oran,Tiaret,Mostaganem, Relizane in the West ; Ouargla and Laghout in the South. From what I understand the call for those protests spread through social media specifically the Facebook but I can't find the point in origin. It is unlike Sudan where the Sudanese professions association played role. Here are some videos and photos from those huge rallies and protests. The rallies against in Algiers "@Mai EL-Sadany"
It is worth to mention that this state is active when it comes to protesting since 2011. Probably the most and biggest protests Algeria have seen since 2011. In 2011, there had been protests in parallel with our protests in Egypt but they were crashed by Algerian security forces where they started before they would spread to other states. Needless to say, there is not enough media coverage for what is happening in Algeria comparing to the rest of North Africa countries. Yet once again, one can’t ignore the fact that the regime in Algeria does not want free foreign press in the country in the first place. Anyhow it seems that there are local media that can cover such movement against all odds and that perceived image about press freedom in Algeria. 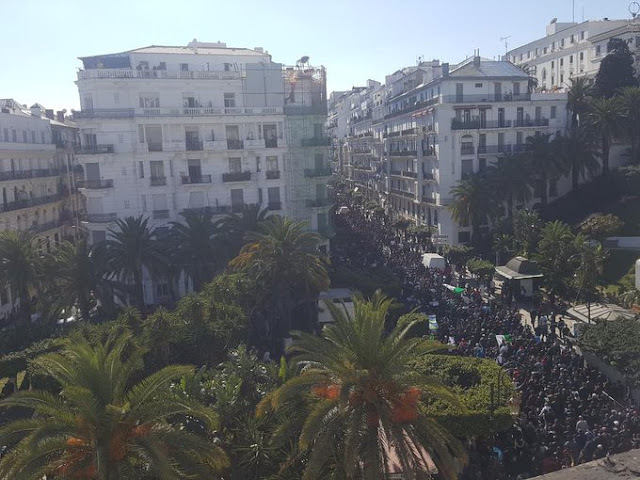 On Saturday, Algerian state TV channels ignored the protests in an expected manner yet unexpectedly the official state-owned Algerian Press Service news “APS” published several news stories about the protests in a neutral way seriously speaking. 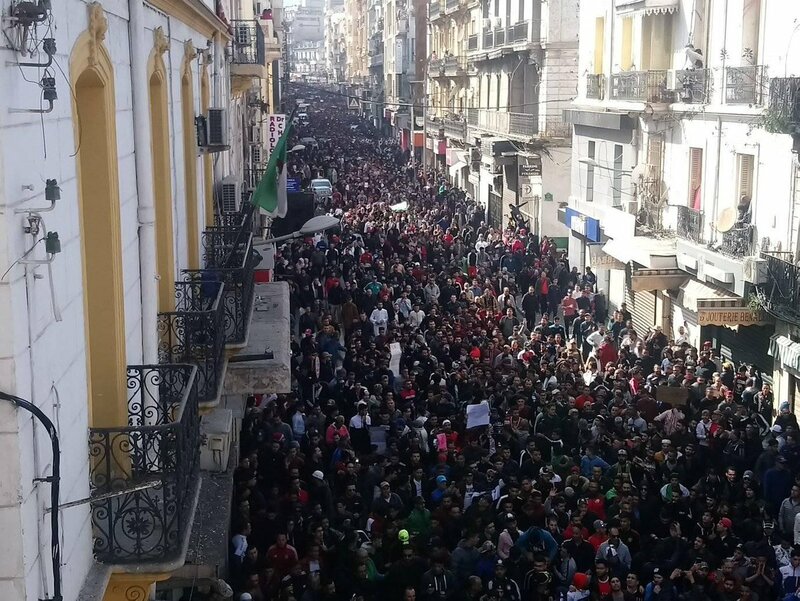 “Hundreds demonstrate in Algiers , several cities to support political claims” APS said in its report about the protests demanding political demands including “political reforms” and “President Bouteflika not to run for a new presidential term”. It reduced the number from thousands to hundreds though. There is no accurate number for the protesters so far but the photos and videos show thousands and not hundreds. It is enough to see the rallies in the capital on that day that many young Algerians will remember for years to come. Back to APS, I find more interesting that it quoted the leader of Islamist National Reform Movement Filaly Ghuini praising the civilized actions of the Algerian people during the protests on Friday. 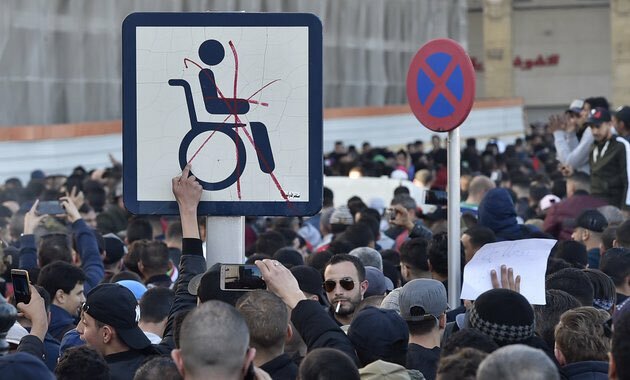 According to APS, the Algerian security authorities 41 people during the protests for attacking authorities and destroying public properties. On Friday, social media network like Twitter and Facebook prove their importance in transferring images and videos from Algeria to the rest of the world. It is not strange to know that at night social media users reported that they could not access Facebook in certain areas. I was hoping to get your thoughts on the nine people who were executed because they were accused of killing Hisham Barakat. Even Barakat's daughter said in a Facebook post of hers that they were not the people who killed him! Her Facebook account was hacked according to her , personally I have got more concerns everyday about capital punishment in Egypt as well in the world.